SoundRoots World Music & Global Culture: Monday's mp3: Where's Babylon? Yes, it's Tuesday, but I'm still calling this Monday's mp3. Such is the power I wield over the Internets. The power of words is more elusive for me today. For example, I hadn't realized how strongly I associated the word "Babylon" with a certain musical style. Now as you undoubtedly know, the historic city of Babylon was the center of a powerful civilization, and was located some 85 km south of present-day Baghdad. The Bible tells how Babylon got so powerful and arrogant that God cursed the inhabitant to speak in many different languages so they could no longer understand each other, then scattered the people throughout the world. Curiously, my subconscious didn't link "Bablylon" with Iraqi music. Or or even Middle Eastern music in general. 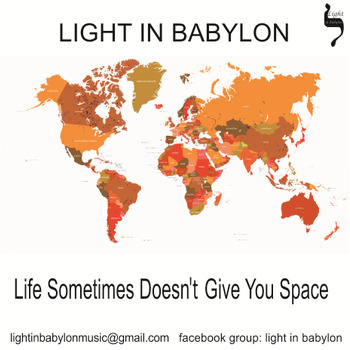 When I recently received a CD called Life Sometimes Doesn't Give You Space from an unknown group called Light in Babylon, my mind told me it reggae. No question. 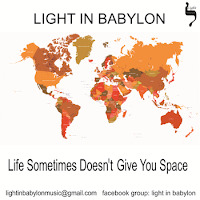 In fact, Light in Babylon is an international group, with an Israeli singer of Iranian origin (Michal Elia Kamal), a Turkish santur player (Mete Ciftci), a French guitarist (Julien Demarque), and friends from these and other nations. Their music is Middle-Eastern flavored, though it crosses boundaries liberally and doesn't hew strictly to any particular tradition. Their mission, the band's website says, is to give "through music all the love, hope and peace that it carries in his heart with the wish that every human will follow the vision of a world full of light." So, I stand corrected. And it makes me curious how the reggae set so co-opted the concept of Babylon in music. And in my mind. I'll look into that. In the meantime, enjoy this fresh engaging album. At least I still have power over the days of the week. > And it makes me curious how the reggae set so co-opted the concept of Babylon in music. In the Old Testament, the concept of Babylon is about people who were forcibly replaced to somewhere they didn't want to be. I guess the slaves who were transported to Jamaica saw a parallel with their own lives.